in Search Marketing with tags analytics, media, natural language processing, oscars Both comments and trackbacks are closed. The Super Bowl blackout. Pharrell’s hat. “Adele Dazeem.” The Internet (namely social media) has a way of amplifying culture moments and turning them into instant sensations. John Travolta’s mystifying pronunciation of Idina Menzel’s name at the Oscars is one such moment. Just seconds after the words “Adele Dazeem” left his mouth, the Internet got to work, creating twitter handles, hashtags, and GIFs that celebrated what emerged as one of the evening’s top memes. We know a little bit about what it takes to make the most of an unexpected moment during a live broadcast, but we were really impressed with how Slate created their widget so quickly. After spending some time putting different names into the generator, the curious minds at 360i got to thinking: what makes it work? Some of us on the media team started putting names in spreadsheets, trying to find linguistic patterns that would reveal the secret – but we couldn’t unlock the code. Frustrated, but not deterred, we consulted our Advanced Analytics team – the dedicated data experts we often utilize to help analyze data to unearth trends and insights from complex media campaigns. After a bit of conversation, we agreed that if we had about a thousand Travoltified names, 360i’s Natural Language Processing (NLP) expert could probably reverse engineer the algorithm in a couple of hours. Scraping the data wouldn’t be a problem, as everyone in the world was posting their names on Twitter and Facebook. Slate uses two arrays: the first is a list of funny first names and the second is a list of funny last names. First, the generator compares the real first name of the person against a series of fake names they have crafted in the tool. A scoring algorithm assigns value to fake names that sound similar to the person’s real name. For example, the generator would assign points if the first letter of the real name is the same as that of the fake name, and more points if the number of syllables in the names matches, or if the names have matching vowels. 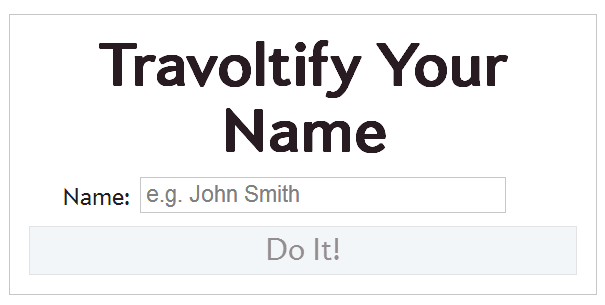 The highest point total assigned to a fake name would be what the tool eventually delivers. The same process is repeated to generate the last name. While the mystery of the Adele Dazeem Name Generator was solved rather quickly, understanding how John Travolta mispronounced Menzel’s so gloriously will be forever beyond our grasp. Judd Schorr (“John Speerce”) and Hua Ai (“Hugh Ajams”) contributed to this report.